Are you seeking more from your Bible study? With three hours of teaching per DVD by Bible professors who know how to communicate the biblical text to today's world, "Deeper Connections" will provide the depth for which you have been looking. Through alternating sections of teaching and group discussion, this Bible study series will allow you to make deeper connections to the life of Jesus through learning more about the historical background, the biblical text, and real-life application. The Last Days of Jesus Participant's Guide by Matt Williams was published by Zondervan in August 2009 and is our 21380th best seller. The ISBN for The Last Days of Jesus Participant's Guide is 9780310293026. 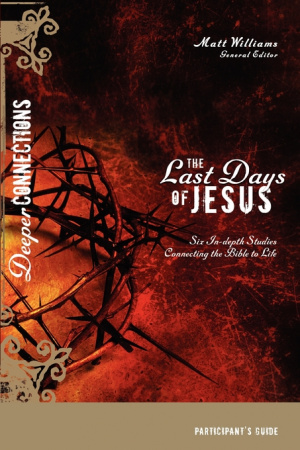 Be the first to review The Last Days of Jesus Participant's Guide! Got a question? No problem! Just click here to ask us about The Last Days of Jesus Participant's Guide.